Four novellas of different genres make up this collection. The first is a western taking place on a ranch made up of toys that are grown from the ground. The second is science fiction, taking place in a world that's on the verge of going completely virtual. The third is a fantasy tale about the wish police stopping the dangerous wishes people make, and the last story is a romance narrated by Death. Loved. Totally, totally loved. Nayeri is incredibly skilled at creating a whole world and well-rounded characters in just a hundred pages. No easy trick. The title, obviously, comes from The Three Little Pigs, but the connection in each story is not always obvious. There are no actual wolves or pigs in any of these stories. It's more about what the houses represent. 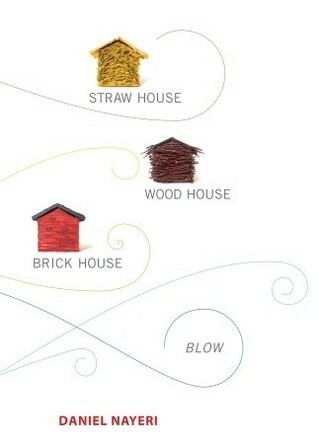 Straw House deals with vulnerability. Wood House the idea that one might not be quite as safe as you think. Brick House actually makes mention of a brick House, which was the most literal interpretation, and Blow was the one I had the hardest time seeing the connection. The first story I wasn't really feeling. It was odd and disjointed and I wasn't sure I fully understood what was going on that whole time. It also ended quite suddenly. However, I absolutely loved the other three stories. I don't think I can even say which one was my favorite. Wood House and Brick House in particular had amazing world creation. They both left me wanting to read more stories that take place in that world. I wanted the novellas to turn into full-length novels so I could know more. I wanted to know more about what happened to the characters. Or it didn't even have to be the same characters. There were such fascinating worlds that any story that took place there I'd love read. Wood House is a science fiction story. In this world, people do most of their living online through virtual representations of themselves, where they can be heroes. Why live in the regular world when you can be a hero online? Those who don't want to live online are therefore referred to as Villains. The Villains are trying to fight against ReCreation Day, the day when Nano-Fidelity hotspots will extend across the world and create a merging of real life with virtual life. It leaves no one with the option to opt out. Janey, a Villain, is sent to deliver a book (a real one, with paper) for her guardian and stumbles into the horrifying truth of nofi technology. It was super creepy. The story was also quite funny. It was excellent storytelling and I want more stories in this world. I felt the same about Brick House. In this world, wishes are real and powerful. Three agents of the Imaginary Crime Unit are called in to stop a wish of a young boy who has wished his family dead on the first star in the sky. His wish becomes entangled with another boys wish, and Saul (a djinn), Ari (a talking fish) and Mack (not clear what she is, claims she's an over-sized leprechaun) must stop them both before it's too late. It was great, with a couple of excellent surprise twist at the end. Again, I want more! More stories in this world! I got to hear Daniel Nayeri speak at the Boston Book Festival, and he was an engaging and fascinating speaker, much like his book. I haven't read anything else by him, but after this, I definitely want to. I'm interested in reading this and was wondering how good a YA series of novellas would be. I will have to find a copy now - thanks for the review! Something for you to enjoy on a long weekend.